In an attempt to crowd-source the next i10 TV commercial with Shah Rukh Khan and engage its target audience, Hyundai India has conceptualized a new digital led campaign. 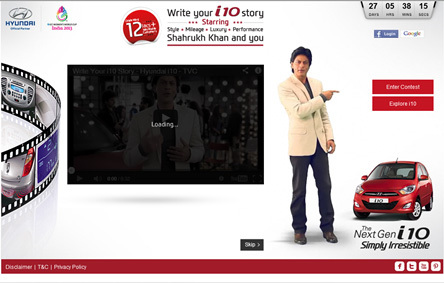 The contest gets users to write the storyboard for the next ad film for i10 starring Shah Rukh. The promo microsite hosts teaser videos with SRK calling for entries and also guiding users on navigating the site. This is a great way to leverage celebrities and create exclusive web content. 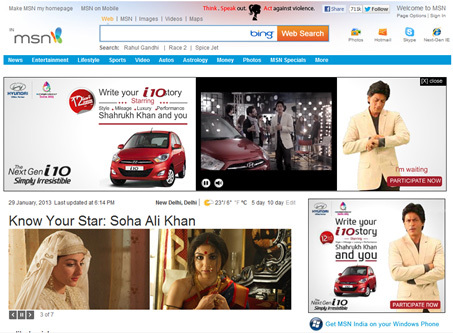 The SRK videos are also being used smartly on rich media across publishers, as seen on the MSN pushdown. The microsite highlights various modes that have been activated to help users share their stories easily. Stories in video, audio or text formats can be uploaded directly on the microsite. Users can also snail mail their stories and send a missed call to a number for a call back (Really!). The creative renditions for this campaign (e.g. the layout and page design) look static and lacking in terms of quality. The intent and ideas are strong and the made-for-web videos are a good touch, but they don’t translate into compelling executions. Considering other advertisers in the Auto category like TATA Motors and Mahindra & Mahindra deliver superb web experiences, they really need to take this up a notch. Don’t you think? Hyundai i series is getting great response in whole world especially Asian market.Its Hyundai i10 and i20 already hit the market with huge success.Now its i30 is a more advanced car with hitech features,spacious interior and powerful engine.